Captain America: Civil War is now available in Digital HD on iTunes. The movie comes with a host of special features exclusive to iTunes, and Forbes reports that Marvel and iTunes Movies worked together to create a new "immersive" set of bonus features for the release. 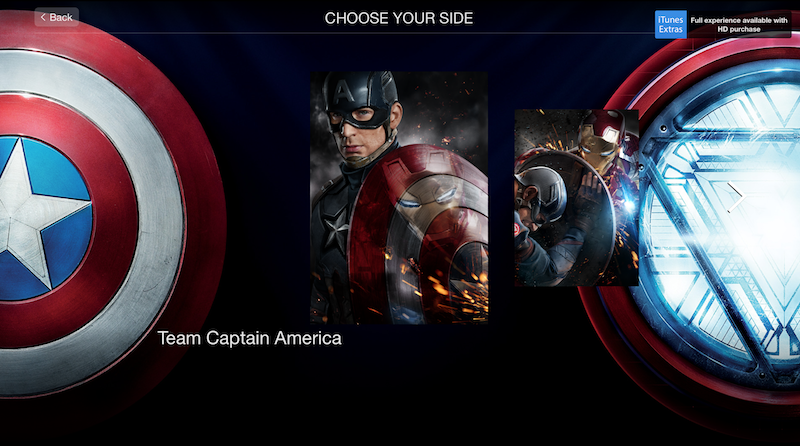 The iTunes edition of the movie comes with a feature titled "Choose Your Side," which lets viewers choose whether they're on Team Cap or Team Iron Man. Choosing a side unlocks a series of exclusive photos, videos, posters, comics and more for each team. According to Forbes, every actor in the film gets an in-depth filmography that includes the actor's photos over the years and quotes from other actors about what it's like to work with them. iTunes movies typically include cast filmographies so users can easily purchase or rent other films a certain actor may have starred in, and they sometimes include exclusive bonus features like audio commentary. In addition to the iTunes-exclusive bonus content, Civil War comes with deleted scenes, audio commentary, a gag reel, a preview of Marvel's upcoming film Doctor Strange and two behind-the-scenes extras. The first is a two-part making-of documentary called "United We Stand, Divided We Fall," and the other is "The Road to Civil War," which charts the journey of Captain America and Iron Man from the beginning of the Marvel Cinematic Universe to their stand-off in Civil War. Apple has also added Team Captain America and Team Iron Man pages to the iTunes Movies carousel. Each page lists movies, comics, music, apps and TV shows tied to the members of that specific team. Is this a Hollywood blog now? I come here for news and rumors about Apple products. If the site is going to just start throwing loosely related content at the wall, MR is coming off my rotation. Please advise, MR staff. Might I suggest reading the numerous articles that are posted about Apple products. You can easily ignore the articles that don't interest you. It's not a requirement to read every post they release. Besides, this is a post about iTunes and it's exclusive content. Woefully bad film, with or without the padding. DONT BUY IT! THIS FILM IS TERRIBLE! What's with the overblown hate? It was very well received by critics and fans alike... I thought the movie was OK, not great, but in line with other Marvel films for sure. Do you guys work for DC or something? First movie I buy on iTunes. Can I get the edition with no Spider-Man? Not even Capitan America himself can save the iPhone 7 from being outdated and over priced before it's released. Enjoy it in glorious iTunes 5mbit 1080p quality. :) Seriously though, Apple should at least double the bitrate. Netflix and Amazon are both superior in quality.